The ALL LAWS OF THE FEDERATION OF NIGERIA APP LFN v.1 (now version 1.2) is a law app of over 570 laws of the Federation of Nigeria. This App is perhaps the most anticipated App for lawyers, Judges, law student, Legal guide and researchers, all law enthusiasts in Nigeria and it is finally on Play-store. 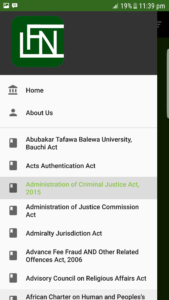 This app is not a standalone app, loaded fully with federal laws in Nigeria, but it is equipped with some sleek features such as a fancy layout optimized for any Android device (phones and tablets), quick search of laws, search for keywords, annotations, quick scroll to last read page, smooth interface and massive add-on features. Why you should download the ALL LAWS OF THE FEDERATION OF NIGERIA APP LFN v.1.2.0 app on your Android phone? Unlimited access anytime to over 570 Federal Laws of Nigeria. All recent laws and amendment of all laws of the Federation of Nigeria up to 2018. Constant update of recent laws once there are passed. Impress client and friends with your knowledge of the law on the go. 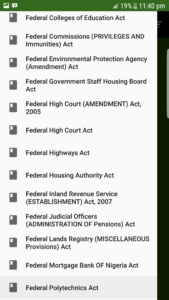 Be able to access all Nigeria Federal Laws even without any internet connection or from an out of service region or area. We live in a digital world where you need to have all your laws on the go. Make quick research at any time and from anywhere in the world. It was made just for you because you are already using an android phone or tablet. 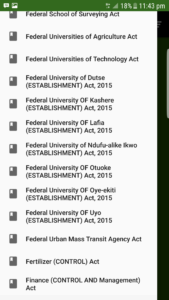 wondering how beautiful the ALL LAWS OF THE FEDERATION OF NIGERIA APP LFN v.1.2 looks? From the pictures, you can tell the U.I and design of the ALL LAWS OF THE FEDERATION OF NIGERIA APP LFN v.1.2 is lovely to behold and possess. Still waiting? Stop procrastinating as others are already using the app to their advantage. You got nothing to honestly lose as the app is free. Download the app here. What laws to expect from the ALL LAWS OF THE FEDERATION OF NIGERIA APP LFN v.1.2 app on Playstore? The ALL LAWS OF THE FEDERATION OF NIGERIA APP LFN v.1.2 contains over 570 laws of the Federation of Nigeria (2018 updates). Do you want more legal Apps like the ALL LAWS OF THE FEDERATION OF NIGERIA APP LFN v.1.2? Then Please do the developers some good by dropping some positive reviews on the ALL LAWS OF THE FEDERATION OF NIGERIA APP LFN v.1.2 play store page to encourage more fantastic legal Apps. 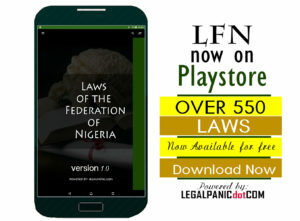 Extra reasons why you should download the ALL LAWS OF THE FEDERATION OF NIGERIA APP LFN v.1.2? Because you are a spontaneous 21st-century lawyer, law student, law researcher or Law enthusiast from Nigeria or anywhere from the world at large and need to have the law on the go.